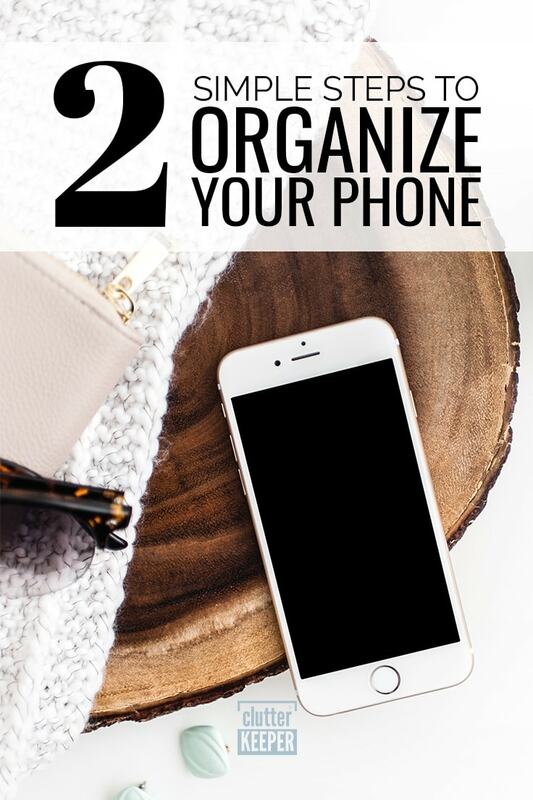 Learn how to organize your phone with this digital organization guide. 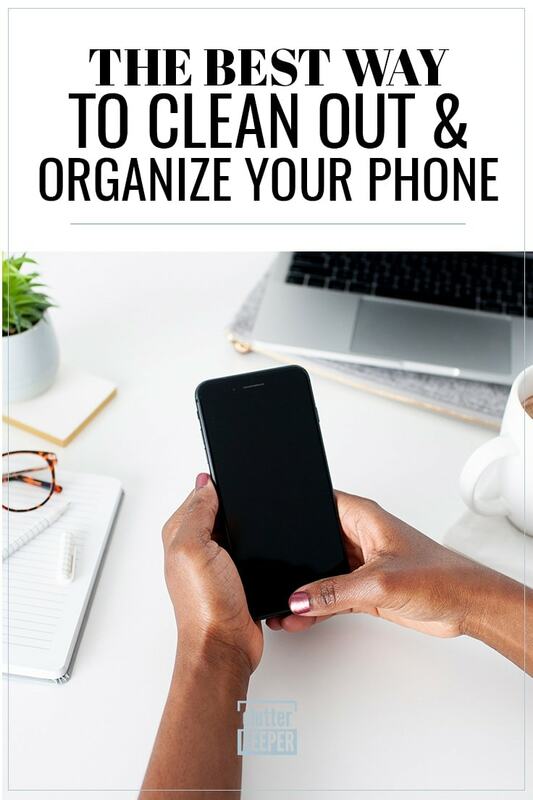 Find helpful tips for cleaning out your cell phone, as well as different ways to organize your apps and files. Do you feel overwhelmed by all of the stuff on your cell phone? Do you have more files installed than you know what to do with? Are you struggling to find the app you’re looking for, or the right person in your contacts list? Then you’ve come to the right place! Today we’re going to teach you how to organize your phone. If your cell phone suffers from disorganization, you aren’t alone. It’s easy to tell yourself you’ll tackle it later – after all, organizing your phone can feel like a pretty intimidating task. 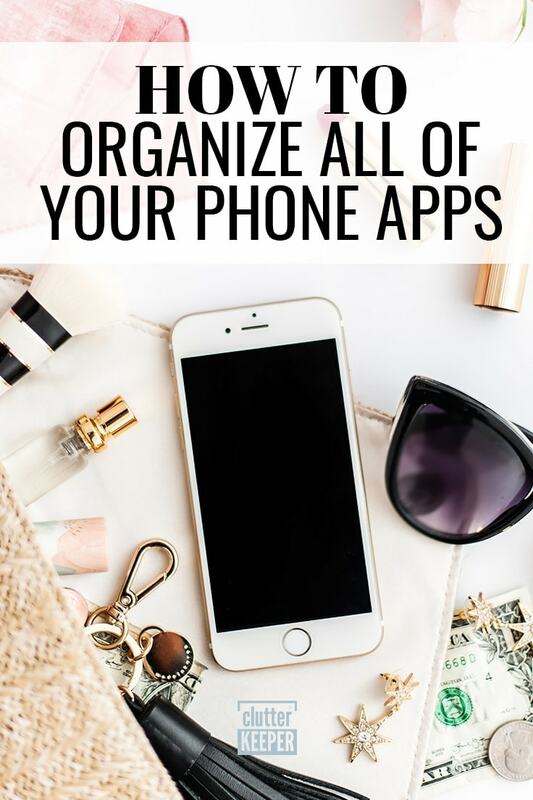 But organizing your phone doesn’t have to be a headache! By following this two-part process, you’ll be surprised to see just how clean your cell phone can be. 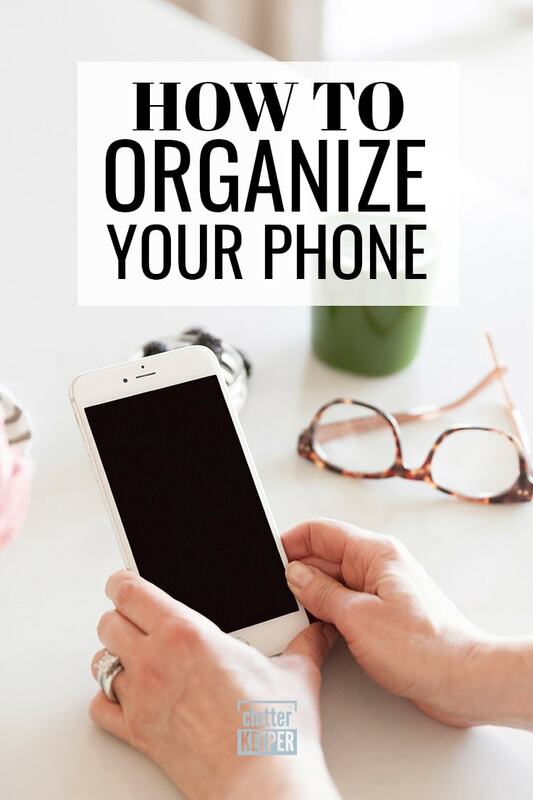 Ready to learn how to organize your cell phone? 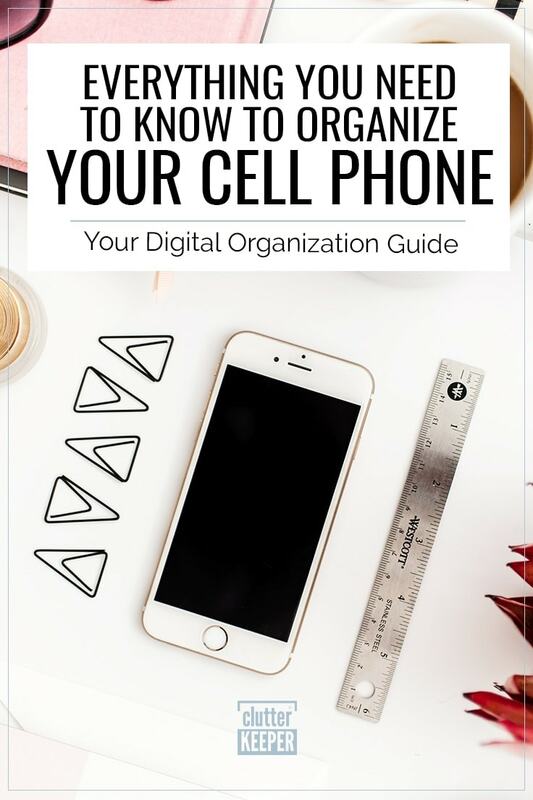 This digital organization guide will help you clean out your phone and organize your files in a way that works for you. By the end, you’ll be equipped with all the information you need to organize your phone. Part One: Clean out your phone. Similar to our homes, our cell phones can collect clutter. Many cell phones come pre-loaded with programs – some of which you can’t even uninstall. And as we use our devices, it’s easy to download a file, install a program, or snap a photo without a thought. All of those little downloads add up over time. Having too many unnecessary files installed can slow down your device and make it harder for you to find the things you need. When was the last time you looked at the address book in your cell phone? If it’s been a while since you’ve organized your contact list, this is a great place to start. Scroll through your contacts and delete any numbers you no longer need. This process may take a while, especially if you’ve ever synced your contact list with your email address book. Take your organization to the next level by finishing profiles for your contacts. Clean up your address book by filling in missing email addresses, last names, or any other information you find useful. You can even add a photo to appear when your favorite contacts call. You can download thousands of free apps with one or two taps on your cell phone’s screen. Many of us install apps that look new or exciting only to find they aren’t very helpful. While we should delete those apps right away, that doesn’t always happen. Chances are, you have more apps than you want or need installed on your device. Review your apps and uninstall the ones you no longer use. You may be surprised to see just how much you delete. The ability to snap a photo or record video anytime, anywhere is one of the best things about cell phones. However, capturing those memories can be a fast way to clutter up your phone. Don’t use your cell phone to store photos and video. Aside from taking up lots of valuable memory, you could lose those files forever if you drop or damage your device. Instead, stay organized with a digital backup service like Google Photos or iCloud Photos. These programs automatically save your photos to the cloud, which allows you to access them from any device with an Internet connection. You’ll still be able to view the photos you want on demand, but they won’t live on your phone. Similar to cleaning out your apps, this can leave you with a surprising amount of extra memory. After you delete the stuff you no longer want or need, it’s time to organize your phone. Many cell phones offer lots of flexibility when it comes to organizing apps. Unfortunately, most people don’t use this to their advantage. Using a cell phone with disorganized apps can be incredibly frustrating. When apps are hidden in folders, it can be impossible to know where to look. And with so many icons cluttering up the screen, it can be hard to pinpoint the one you need. You can waste a lot of time scrolling through your device when you don’t know where to find something. Organize your apps in alphabetical order. Looking for a literal way to organize your apps that’s easy to follow? Arrange them on your screen in alphabetical order. Divide them into letter-specific folders or simply lay them out individually, depending on the number of apps you keep on your device. As long as you know the name of the app you’re looking for, you’re guaranteed to find it quickly. Organize your apps by function. Another easy way to organize your apps is to sort them into folders by function. 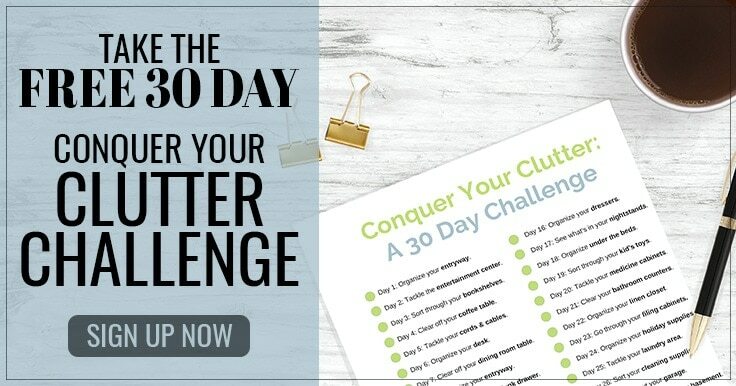 You can create as few or as many folders as you’d like, so think about what works best for you – or look around online and see how others have done it! Banking and Bills – for bank applications, digital payment methods, and bill pay apps. Social Media – for Snapchat, Facebook, Instagram, LinkedIn, and others. Photo and Video – for apps that help you record and edit your digital media. Music and Media – for Spotify, Apple Music, YouTube, and other streaming apps. Games – for all of your favorite cell phone games. Health and Fitness – for calorie trackers, workout apps, and others. Family Command Center – for your to-do lists, calendars, notes, and apps that help you stay connected with family and manage your household. Organize your apps by how often you use them. If you prefer a more functional approach to your cell phone, you can organize your apps based on how much use they get. Create a folder in the front and center of your screen and drag in the icons for your most-used apps. Whether you use your phone to read the news, keep in touch with friends, or learn new skills, you can make this method work to your advantage. Not sure if one of these organizational methods will work for you? That’s ok! You can easily find lots of other ideas online. Organizing your cell phone doesn’t have to be an impossible task. By methodically removing apps, photos, and unneeded files, you’ll be able to assess what’s important and lay it out in a way that makes sense to you – and you’ll be able to enjoy your phone without the stress of searching for the stuff you need. 10 Creative Ways to Hide Cord Clutter – organize your cell phone charger and other cords with this helpful guide. Home Office Organization: Your Complete Guide – learn how to organize and decorate your home office. 5 Tips for Getting Organized – see how digital organization can help you save space and preserve the things you want to save.